The GRI Reporters’ Summit, aimed at professionals who direct and manage sustainability reporting within their organizations, is an opportunity to learn more about the practicalities of reporting and get the latest on innovation and recent developments in the field. Participants will leave the Summit armed with specific tools, case studies and practical solutions, for more effective stewardship of an organization’s sustainability management and reporting journey. The program includes tracks for reporters at all levels of experience. New reporters can benefit from a GRI Standards Master class, while more experienced practitioners can dive deeper into advanced topics including report design and audience segmentation in a Communications Master class. Expert-led workshops will cover important topics such as the SDGs, reporting for investors, assurance, management disclosures, ratings & rankings and the recently updated Water & Effluents and OH&S Standards. Read more on the sessions and find an overview of confirmed speakers on the Reporters’ Summit web page, which is updated on a regular basis. Take advantage of the early fee for GRI’s 3rd Annual Reporters’ Summit and register before January 18! 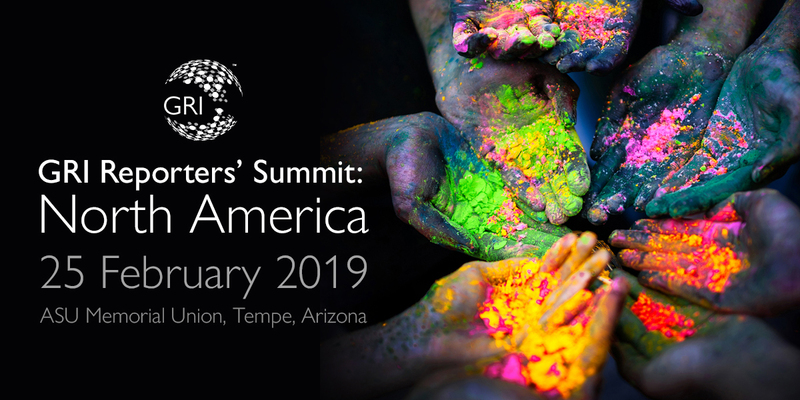 And if this were not enough, report preparers can always stick around for GreenBiz 19, to engage with the most influential sustainability leaders in nearby Phoenix, Arizona. Save 20% on registration for GreenBiz 19 by applying discount code GB19GRI here. Would you like the latest updates about GRI's events in your inbox? Sign up for communications from GRI.